All the ingredients are listed in order of their descending weight, this means that the food contains more of the ingredients listed first; and less of those listed last. For example the closer sugar is listed to the start of the ingredients, the more sugar the food contains. **Remember sugar can be described by many different names including sucrose, glucose, glucose syrup, fructose, glucose-fructose syrup, maltose, maltodextrin, invert sugar, golden syrup, maple syrup, molasses and honey. **Fat can also go by many names for example: butter, dripping, lard, milk fat, cream, vegetable oil, vegetable fat, peanut oil (or other nut oil), monoglycerides, trans fats and hydrogenated fat. The nutritional information tells you how much of each nutrient the food product contains per 100g, or per 100ml of fluid. It can also break this down per serving, for example per bar, per slice, per pot of yogurt. Some food manufacturers list energy (Kjoules and kcal or calories) and three main nutrients – protein carbohydrate and fat. Others provide a more extended nutrient list that includes sugar, saturated fat, fibre, sodium and sometimes vitamins and/or minerals. The RDA is the recommended daily allowance – how much you need of any nutrient each day. If a vitamin or mineral is listed in the nutritional information, then the percentages of the RDA for that nutrient per 100g and per portion is also provided. How to compare products. If you want to know whether or not a food is high or low in a particular nutrient or want to compare the nutrient content of similar foods, then check out nutrient content per 100g or per 100ml. For example, if you want to know which hard cheese contained the least amount of fat then you would compare the fat content per 100g across the different hard cheeses. Looking at the label can also help you decide whether the product contains ‘a little’ or ‘a lot’ of fat, sugar, salt, and fibre. If the quantities fall between the ‘a little’ or ‘a lot’ then food contains a moderate amount. **Remember salt contains sodium but sodium content is not the same as salt content. To convert sodium to salt, multiply the sodium value by 2.5 to get the correct salt content. 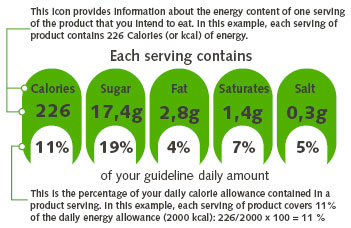 Nutritional information is usually presented per 100g of food. The ‘per serving’ column tells you how much nutrients you are likely to consume in a typical serving of the food. The ‘per 100g’ column allows you to compare the nutritional content with similar foods. So what does table 2 tells us about the product? It is high in sugar – it contains 25g per 100g of food. Contain a ‘source’ of fibre – it contains 3.4g of fibre which is greater than the ‘source’ of fibre cut off of 3g per 100g. It is high in salt as it contains more than 0.5g of sodium per 100g. Contains 25% of the iron RDA per serving.